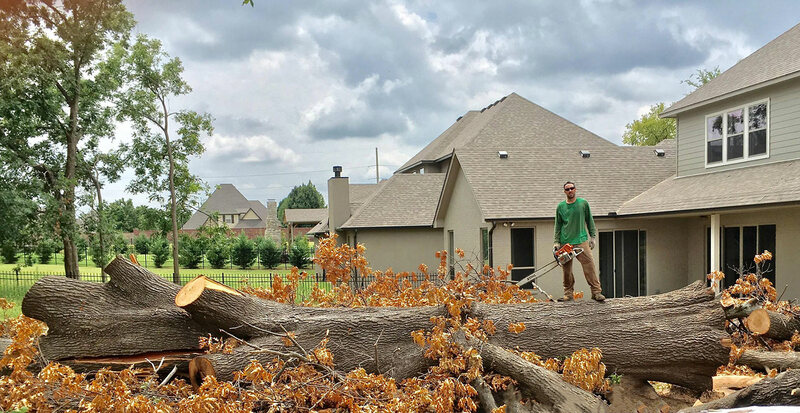 BP Trees, LLC is an Oklahoma based company specializing in tree services such as tree removal and tree trimming with an extra special focus on dead, rotting and/or dangerous limbs. We offer competitive bids or hourly rates depending on your needs. As a locally owned and fully insured company we are familiar with tree issues unique to Oklahoma. If you are unsure about your trees or just want the peace of mind that comes with having a professional come give your trees the “Thumbs Up”, then give us a call. All estimates and tree health analysis’s are FREE. There’s nothing to lose. In Oklahoma we say, “It’s not IF, but WHEN will the next high wind or ice storm hit”. When these storms roll through town you want to be absolutely sure that your trees are healthy and haven’t been compromised by previous storms. This is especially true for larger trees near your home. Homeowners are often encouraged to remove large limbs overhanging roof lines to remove the risk of damage during a storm. If you are unsure about your trees or just want the peace of mind that comes with having a professional come give your trees the “Thumbs Up”, then give us a call. All estimates and tree health analysis’s are FREE. There’s nothing to lose.